The Palettable API has also been updated for the IPython age. All available palettes are now loaded at import and are available for your tab-completion pleasure. Need the YlGnBu palette with nine colors? That’s now available at palettable.colorbrewer.sequential.YlGnBu_9. Reversed palettes are also available with a _r suffix. P.S. : Here’s a little demo notebook. 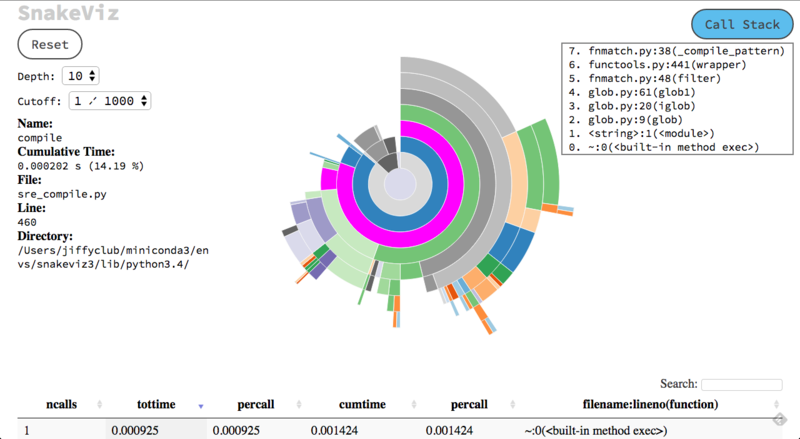 It has been over two years since Erik Bray and I made the first release of SnakeViz 0.1, a tool for visualizing performance profiles of Python code. It had multiple performance bottlenecks, but it worked just well enough that it took me a long time to prioritize making improvements. That time has finally come around and I’m happy to announce that SnakeViz 0.2 is now available! Those limited the usefulness of SnakeViz with profiles that contained calls to a lot of functions. The version 0.2 release is an almost complete rewrite in order to make SnakeViz work with larger profiles. The first limitation is addressed by moving the building of call trees into the client application. Profile data is passed from the server to the client in close to the same form as it’s available from Python’s pstats module. Once in the client, the profile data is used to construct call trees on demand for visualization. I and others have tested SnakeViz 0.2 with some fairly large profiles and found it works. You can read more about SnakeViz in the updated docs. Please give it a try! Issues can be reported on GitHub. Docker is a great tool for getting lightweight, isolated Linux environments. It uses technology that doesn’t work natively on Macs. Until now you’ve had to boot into a VM to install and use Docker, but it’s now a little easier than that. As of Docker 0.8 it can be run on Macs thanks to a specially developed, lightweight VirtualBox VM. There are official instructions for installing Docker on Mac, but with Homebrew and cask it’s even easier. Use ctrl-D to exit. I find this especially helpful for very quickly getting to a Linux command line from my Mac for testing this or that, like checking what versions of software are installing by apt-get. Visit the Docker documentation to learn more about what you can do with Docker and how to do it. For fun I’ve been learning a bit about the GitHub API. Using the API it’s possible to do just about everything you can do on GitHub itself, from commenting on PRs to adding commits to a repo. Here I’m going to show how to do add commits to a repo on GitHub. A notebook demonstrating things with code is available here, but you may want to read this post first for the high level view. The GitHub API is an HTTP interface so you can talk to it via any tool that speaks HTTP, including things like curl. To make programming with the API simpler there are a number of libraries that allow communicate with GitHub via means native to whatever language you’re using. I’m using Python and I went with the github3.py library based on its Python 3 compatibility, active development, and good documentation. The repository api is the gateway for doing anything to a repo. In github3.py this is corresponds to the repository module. The special case of making a commit affecting a single file is much simpler than affecting multiple files. Creating, updating, and deleting a file can be done via a single API call once you have enough information to specify what you want done. Making a commit affecting multiple files requires making multiple API calls and some understanding of Git’s internal data store. That’s because to change multiple files you have to add all the changes to the repo one at a time before making a commit. The process is outlined in full in the API docs about Git data. I should note that I think deleting multiple files in a single commit requires a slightly different procedure, one I’ll cover in another post.